This is an easy and delicious breakfast or brunch recipe that can be made in less than 20 minutes, start to finish. 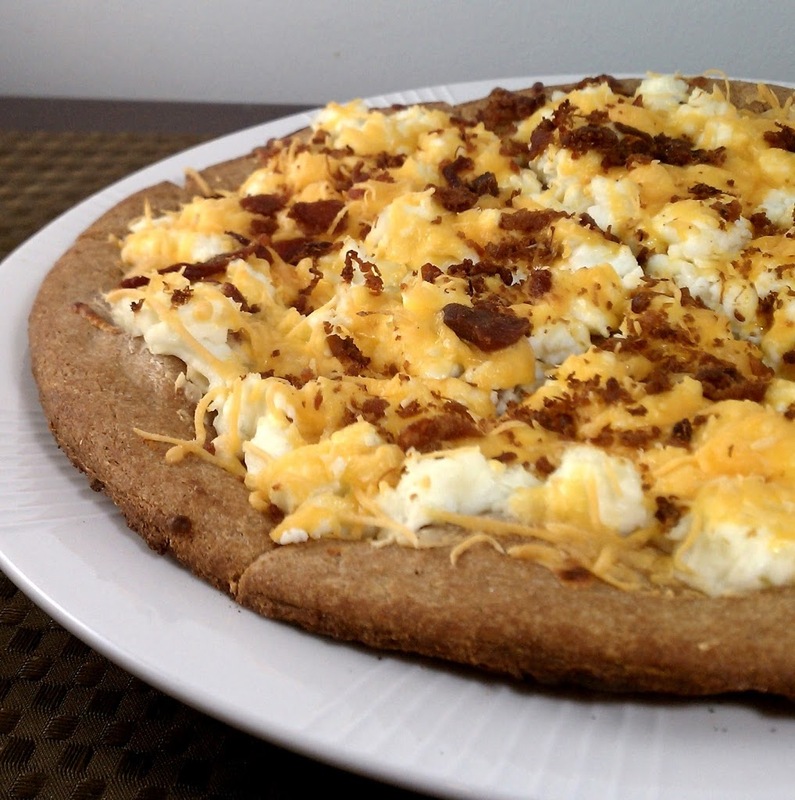 I love breakfast pizza, but most of the kinds you can get at restaurants or grocery stores are awful for you, so I was looking forward to trying out my own lighter version. I think the Queso Fresco & Chipotle Laughing Cow flavor gives this a little extra kick, but you can substitute another flavor if you wish. This was very good and filling and a side of fruit makes it a complete breakfast! Spray large nonstick skillet with cooking spray and bring to med-high heat. Add egg whites and cook, seasoning to taste with salt & pepper and breaking up with a wooden spoon to scramble. Remove from heat. Spread Laughing Cow wedges evenly across the top surface of the pizza crust, leaving at least a ½ inch edge around the outside. Top this layer with the scrambled egg whites, spreading them evenly across the cheese. Sprinkle the shredded cheese over the top of the egg and the bacon bits over the top of that. Place pizza on a foil covered baking sheet, a pizza stone or straight onto the oven rack (depending on how you like your crust) and bake for 8-10 minutes. WOW! That looks so deliciously awesome – when we have friends in town in a few weeks, I am definitely making this for breakfast. Thanks for the great idea! Can’t wait to make this! But seeing as I’m cooking for one, do you think it will last for an entire week in the fridge? I can only imagine eating one piece a day. What do you do with yours? I actually made this when I had company, so that wasn’t an issue, but I would probably have eaten more than one piece per day if there were leftovers. I would only keep it in the fridge for a few days after. If you can’t imagine wanting more than one piece per day you could always buy the smaller Boboli Crust and reduce the portions of all the toppings. This is for a 12″ crust but they also make an 8″ crust. Hope that helps! I just made this with Sun Dried Tomato Mozzarella Laughing Cow and substituted the cheddar cheese for fat-free mozzarella. Really good! I put it in the recipe builder and found it to come out to 5 points+ per serving! I loved this. For me it was a good base recipe, because I loaded it up with a few other things. Fresh tomatoes, diced onions, diced green peppers, and used real center cut bacon instead of pre-packaged pieces. Then I leave off the cheese topping all together, its got sooo many other flavors going on, it really doesnt need the cheese (or at least I dont think so). That’s my favorite flavor of Laughing Cow! Glad you were able to adapt this to your liking! I made this this morning. I ran across the recipe last night and went to the grocery store before 11 pm to get the ingredients! I made it this morning. Was really good. I cooked up some onion, mushrooms and spinach in olive oil, then added the egg whites to it. The boy isn’t a fan of healthy but after 3 slices each topped with salsa he said it was amazing! Thanks for the recipe! I am going to try this with egg beaters. I hope it turns out since this sounds really good and easy. 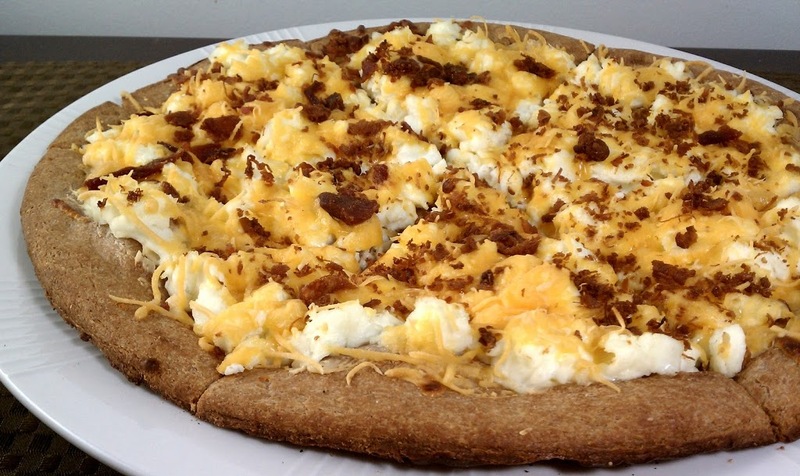 How many SP is this breakfast Pizza ?